Pictured are Claire Wilkin and Ashlie Hillyer showing their goats at the 2018 Highland County Fair. During the 2018 Highland County Fair the Hillsboro FFA Chapter had 10 members exhibit goats. The members were Ashlie Hillyer, Grant Crum, Riley Burba, Heather Burba, Claire Wilkin, Lana Grover, Christine Page, Clara Page, Haley Hughes and Kelcie Thornburgh. Members participated in showmanship, skillathon, County Bred and Born Show and the Jr. Show. On Sunday, Sept. 2, these kids participated in the County Bred and Born Show and also showmanship. In the County Bred and Born Show, Hillyer placed first in both her classes, Crum placed fourth in one class and third in the other class, Burba placed second in one class and first in the other class, Wilkin placed second in both classes, Christine Page placed seventh and eighth in her classes, Clara Page placed fourth in one class and third in the other class, Hghes placed third in her class and Thornburgh placed first in her class. In the final drive for the County Bred and Born, Hillyer had the Grand Champion, Thornburgh had the Reserve Champion, and Wilkin was third overall. Wilkin also won overall goat showmanship. On Monday, Sept. 3, members participated in the Jr. Goat Shows. In the Utility Boer Jr. Doe 6 to 9 months, Wilkin had Grand Champion, Hillyer had Reserve Champion and Grant Crum had the third overall doe. In the Utility Boer Jr. Doe 90 to 12 months, Crum had Grand Champion doe. In the Utility Boer Sr. Doe 12-18 months, Lana Grover had Reserve Champion and Ashlie Hillyer had third overall. Hillyer had the Reserve Champion overall in Sr. Utility Boer Doe. In the Market Boer Goat Show, Wilkin had Lightweight Division Reserve Champion Goat. In the Middleweight Division, Hillyer had Grand Champion and Wilkin had Reserve Champion. In the Heavyweight Division, Thornburgh had Reserve Champion Market Boer Goat. 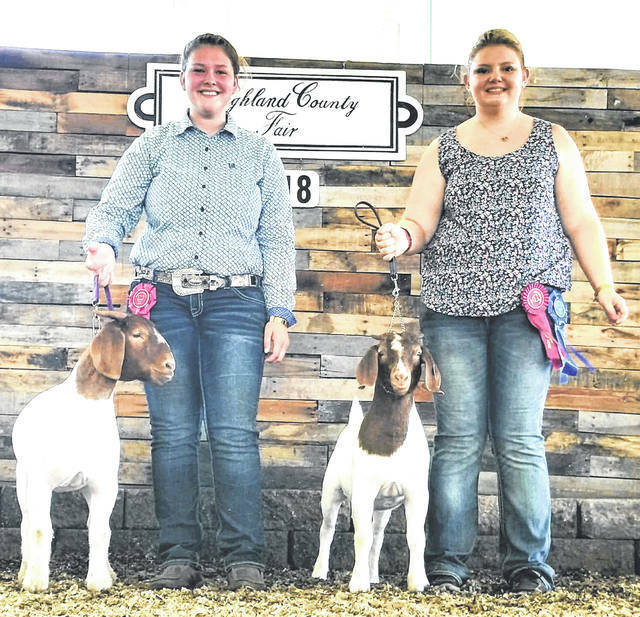 https://www.timesgazette.com/wp-content/uploads/sites/33/2018/09/web1_Goat-pic.jpgPictured are Claire Wilkin and Ashlie Hillyer showing their goats at the 2018 Highland County Fair.